Heat oven to 375°F. Spray large cookie sheet with cooking spray, or cover with cooking parchment paper. On cutting board, unroll dough; separate into 8 triangles. From center of longest side to opposite point, cut each triangle in half, making 16 triangles. Shape each as needed to look like ghost shape. Arrange triangles on cookie sheet, folding narrow point under about 1/ 2 inch, to form head of ghost. Bake about 7 minutes or until slightly puffed and just beginning to brown. 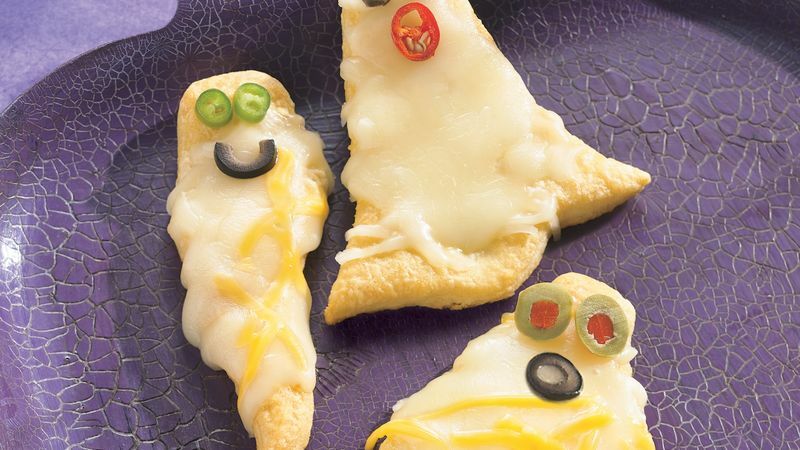 Sprinkle each ghost with 1 tablespoon cheese; top with sliced olives to form mouth and eyes. Bake 2 to 3 minutes longer or until cheese is melted. Cook 1 clove garlic, finely chopped, in 1 tablespoon butter, and brush over dough before topping with cheese. Be creative and use what you have on hand to add mouths and eyes to the ghosts--nuts, dill pickles or cut-up tomato will all work.